It is quite alarming the amount of content that Facebook is restricting from Indian users. According to the Transparency report released by Facebook for 2nd half of 2014, India leads the content restriction done for any country, that too by a fair margin. Facebook removed 5832 pieces of content posted by Indian users – In comparison, United States had none, United Kingdom had 3, Germany had 60 and France had 13 pieces of content removed. Have a look at this graph below to understand, just how much content gets restricted from Indian users. As far as request for user data is concerned, India made 5473 requests in which 7281 data accounts were referenced. In comparison US made 14, 274 requests and UK made 2,366 user data requests. Here are top 10 countries who made maximum number of user data requests to Facebook. While India made 2nd highest number of requests, Facebook complied with only 44.69% requests and produced some data against those requests. 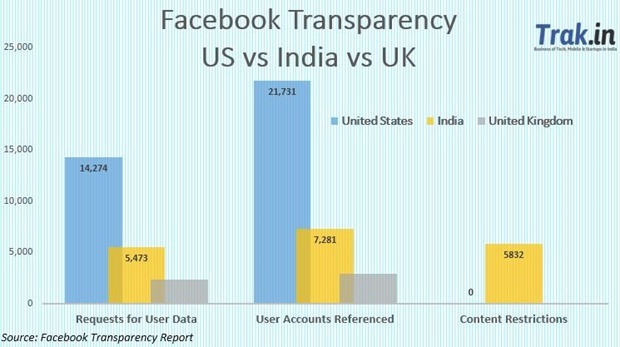 US and UK both had much higher percentage of compliance to requests from Facebook. While in most other countries, the number of requests have come down, for India, the requests went up. In the first half of 2014, India had made 4,559 requests referencing 5,958 accounts. Even when it came to content restrictions, the numbers have gone up. In first half of 2014, a total 4960 pieces of contents were restricted, which increased to 5832 in second half of 2014. When does content get restricted by Facebook? According to Facebook, they restrict access to content which is reported primarily by law enforcement agencies and the India Computer Emergency Response Team within the Ministry of Communications and Information Technology including anti-religious content and hate speech that could cause unrest and disharmony. If the content does not fall into these brackets, Facebook refuses to remove the content from its platform. The Wonderful World Of AMA’s – Why Have They Become So Popular?